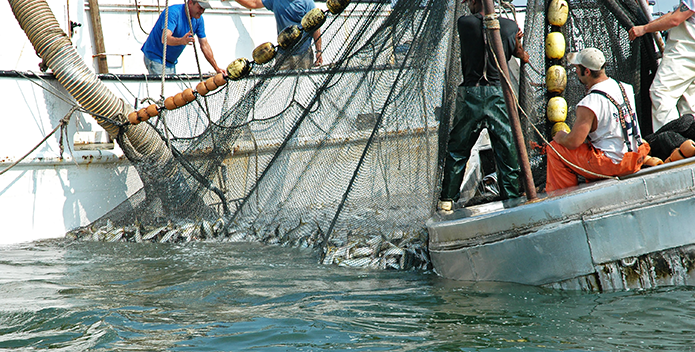 Commercial fishing boats pull up a net chock-full of menhaden. The following first appeared in The Free Lance-Star. At one time, schools of menhaden in Virginia were so vast that fishermen and fishery managers thought the population was virtually inexhaustible. Despite having little value as table fare, these small silvery fish that range all along the Atlantic Coast from Maine to Florida were sought out by companies that harvested them—not to be eaten, but to be cooked into valuable fish meal and fish oil. Known as the reduction industry, this fishery is now highly automated and efficient, using planes to help spot the fish from above and a combination of net boats and steamers to bring them back to the fishery's hub in Reedville. Although much smaller, the bait fishery remains of regional significance as well due to menhaden's importance to commercial and recreational fishermen. Menhaden are often called "the most important fish in the sea" because of their critical role in the food chain. Anglers, birders, and conservationists have long recognized the need to ensure an abundance of menhaden to feed the many predators that devour these small nutrient-packed morsels. Nowhere is this more important than in Virginia, where menhaden are a key component in the diets of striped bass, bluefish, osprey, and other species that are economically important and cultural icons of the Chesapeake Bay and Rappahannock River. Right now we have a historic opportunity to protect menhaden for both fish and fishermen. The Atlantic States Marine Fisheries Commission, which manages the menhaden fishery, is gathering public input for an update to the fishery management plan for menhaden. More than 85 percent of the total menhaden catch on the Atlantic Coast is landed in Virginia. The debate on how to better divide the harvest between the states was detailed in a recent Free Lance-Star article titled "Menhaden battle once again pits Virginia against Northern States" (Sept. 23). But the most important point in this discussion is the move to develop ecological reference points, management targets that would take into account menhaden's role as food for larger fish and other predators. 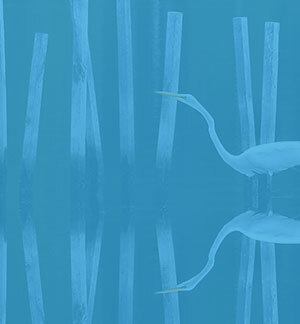 Since the first management plan was adopted in the early 1980s, menhaden have been managed with limited thought for their important ecological role. While this works for managing predatory fish such as striped bass and bluefish, we need a different approach for fish lower in the food chain, such as menhaden. We have come a long way, but a lot still needs to be done to ensure a healthy ecosystem. Up until 2012 the number of menhaden harvested along the Atlantic Coast was virtually unrestricted. Fortunately, a precautionary harvest cap had been placed on much of the Virginia portion of the Chesapeake Bay to address concerns about the link between healthy predators and prey in this important nursery ground. The development of ecological reference points for menhaden is such a timely issue that the fisheries scientists who support ASMFC have suggested making it high priority. A drop in the menhaden population could threaten a variety of species, including weakfish, striped bass, whales, dolphins, and osprey. Fortunately, these ecological reference points will provide the necessary guideposts to ensure that enough menhaden are in our local waterways—not only for a healthy menhaden harvest, but also for all the other species that depend on menhaden. Restoring the menhaden population both along the Atlantic Coast and in the Chesapeake Bay will benefit all Virginians. More fish will mean more opportunities for our recreational anglers and more robust commercial fisheries. Successful fisheries management has brought great results for iconic Bay species such as striped bass, blue crabs, and oysters. These decisions have led to a rebound of species from lows that imperiled both their ecological and economic might. It's time to give menhaden the same respect. Chris Moore is the Senior Regional Ecosystem Scientist for the Chesapeake Bay Foundation. Richard Moncure is the Tidal River Steward for Friends of the Rappahannock.